Robustness - radiation shield mount should ideally be made of corrosion resistant metal for strength and longevity and white in color to prevent overheating of the OAT sensor on sunny days. Easy mounting - sensor and radiation shield mount should permit easy pole mounting and wall mounting. The mount should position the OAT sensor at least 8 inches (20 cm) from the mounting surface or wall. High-quality radiation shield - quite a bit of money can be saved on temperature sensor cost by spending a little extra on a very good radiation shield. A high-quality radiation shield is especially important on hot sunny days since it determines the air temperature a sensor will measure. 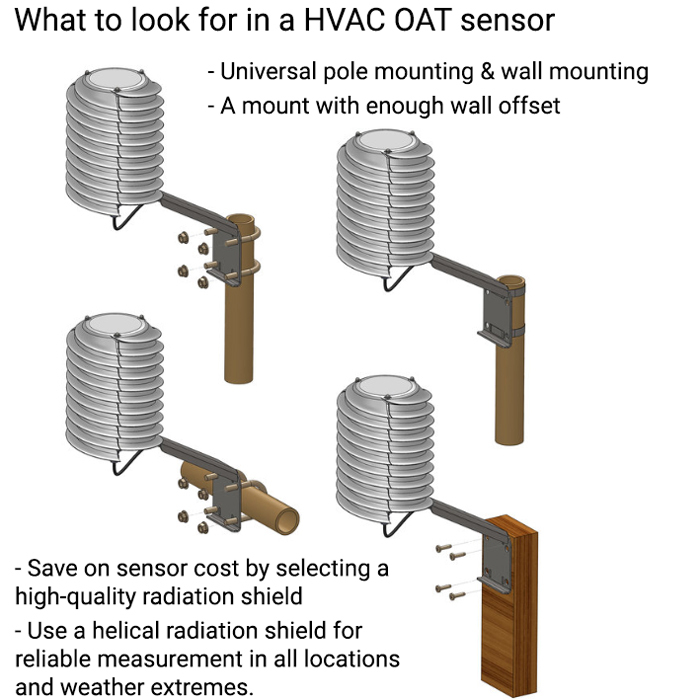 The trade-off between high-cost or a high-quality OAT sensor lies in the understanding that a temperature sensor will measure temperature only of air inside the radiation shield. In low-quality shields, even the most accurate and expensive sensors will measure unrealistically high air temperatures due to influences of wall heat radiating onto the shield or due to heating from direct or reflected sunlight. Overall system savings can be maximized by using a helical solar shield as written about in Meteorological Industry News and HVAC & Refrigeration Insider®. This blog may contain opinions of the author(s) and opinions of 3rd parties who have decided to comment on blog posts contained in this blog section of this website. Should you find any part of this blog offensive or inappropriate or if you find any part of this blog to contain copyright material or violates privacy or other laws and/or rights of any companies or individuals, you are responsible to 1st notify us immediately via our contact page before pursuing legal actions so that we may take immediate corrective actions and remove or correct any content violations that were not seen, caught or registered by the blog moderator(s). The purpose of this blog is to inform visitors of content relating to the BARANI DESIGN Technologies s.r.o. company, its products and services. If comparisons to other products and manufacturers are drawn, they are the opinions of the authors, their intent is not to slander but to point out differences between products and perceived business strategies and practices in the market place.